A question I received: If you worked on Wall Street, would you not have done the same? They had an opportunity to embellish stock prices, fool the world, and receive a return of hundreds more times what the stock was originally worth. The problem is that the lies came to the surface and the stocks collapsed. So now the government is lining the pockets of the bankrupted financiers just to keep the entire system from crumbling. What’s next? My Answer: By causing us to develop, Nature is pressuring us to find a solution. Kabbalah offers people a way to learn about the global world we have found ourselves in – a world of total, universal interconnection. Then, using this knowledge, we will be able to build a new society as well as a new kind of personal and public relations. This wisdom enables people to see that we will reach a terrible outcome – such as wars and natural disasters – if we continue to develop arbitrarily. This outcome is opposite to the social change that Nature requires of us in a global world. The needed change is to create more global connections, mutual understanding and common participation. 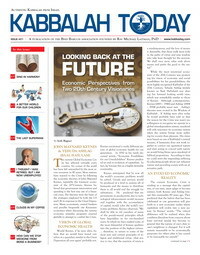 Issue 21 of Kabbalah Today is now available. My Comment: If a person wants to have a lasting relationship with someone, he shouldn’t try to go and change the type of relationship they have. If what you want is to create a family with someone, then that’s exactly what you should do. People should regard familial relationships just as nature had determined them to be.